The study of metallurgy and its impact on bandsaw blades is invaluable knowledge for any machine or woodworking shop employee and key to proper application in any cutting process. To better understand the need-of-use for the different types of saw blades and their effect on different types of materials, a better understanding of the terminology and application becomes more clear. Metallurgy is the study of physical and chemical behavior of metallic elements, their inter-metallic compounds, and their mixtures, which are called alloys. Another way of describing it is the way in which science is applied to the production of metals and the engineering of metal components for use in products designed for consumer and manufacturer use. Metallurgy is subdivided into ferrous (black) metallurgy and non-ferrous (colored) metallurgy. Ferrous metallurgy involves processes and alloys based on iron and accounts for 95% of world metal production. Non-ferrous metal is any metal, including alloys, that is a mixture of solid solution composed of a metal and another element that does not contain iron — a chemical compound — in appreciable amounts and involves processes and alloys based on other metals. Generally more expensive than ferrous metals, non-ferrous metals are used because of their desirable properties to include low weight, higher conductivity, non-magnetic properties, and resistance to corrosion (oxidation). Aluminum, chromium, titanium, and nickel are just a few examples of non-ferrous metals. Alloy steel is an alloy of iron and carbon that is widely used because of its hardness and tensile strength. The carbon in typical steel alloys may contribute up to 2.1% of its weight. Varying the amount of alloying elements controls qualities such as the hardness, ductility, and tensile strength. Steel is alloyed with a variety of elements in total amounts between 1.0% and 50% by weight to improve its mechanical properties. Alloy steels are broken down into two groups: low-alloy and high-alloy. Most commonly, alloy steel refers to low-alloy steels. However, the use of alloy steel in general is the standard reference to steels with other alloying elements in addition to carbon. Manganese, which is often found in combination with iron, is a metal with important industrial metal alloy uses, particularly in stainless steels. Manganese is essential to iron and steel production due to its sulfur-fixing, de-oxidizing, and alloying properties. Small amounts of manganese improve the work-ability of steel at high temperatures. Aluminium with a manganese content of roughly 1.5% has an increased resistance to corrosion. Nickel, a silvery-white, lustrous metal with a slight golden tinge, belongs to the transition metals and is hard and ductile. Nickel is used as a binder in cemented tungsten carbide (hard metal) and adds corrosion-resistant properties to cemented tungsten carbide parts, but the hardness is lower than those made with cobalt binder. Chromium is a steely-gray, lustrous, hard and brittle metal with a high polish that resists tarnish and has a high melting point. The relative high hardness and corrosion resistance of unalloyed chromium make it a good surface coating and thus a popular metal coating because of this durability factor. Molybdenum, a name with ancient Greek origins that mean lead (due to the belief in it being lead ores), is a silvery metal with a gray cast. It has a very high melting point and easily forms hard, stable carbides in alloys, making it an element most-produced (about 80%) in many types of steel alloys, including high strength and super alloys. Vanadium is a hard, silvery gray, ductile and malleable transition metal. It is harder than most metals and steels, and it has good corrosion resistance and stability against alkalis, sulfuric, and hydrochloric acids. Most often used as an alloy additive to improve steels. Silicon (Ferrosilicon) is an iron-silicon alloy that contains varying ratios of elemental silicon. Aluminium-silicon alloys (silumin alloys) added to aluminium improves its casting properties. Elemental silicon is added to molten cast iron as ferrosilicon (silicocalcium alloys) to improve performance in casting thin sections and to prevent the formation of cementite when exposed to air. Boron is classified as a metalloid and is found in small amounts in meteoroids but not naturally on Earth. Industrially, it is difficult to produce and tends to form refractory materials containing small amounts of carbon or other elements. Industrial-scale use of boron compounds as additives for glass fibers are used for insulation or as structural materials. In the United States, 70% of boron production is used for glass and ceramics. The use for some of these exotic materials include such high impact devices like jet engine turbine blades, and the components of spacecraft and in nuclear reactors. Carbon and Bi-Metal blades, whether flex-back or hard-back, are economical for cutting low-alloy steels and non-ferrous metals. Metals such as brass, bronze, structural steels, and carbon steels can also be cut using a carbon blade. All other metals that are tough or harder than the low-alloy metals mentioned above must be cut using bi-metal blades. In some cases, it is best to use the more expensive or specialized bandsaw blades, to include carbide-tipped or HP Blades. 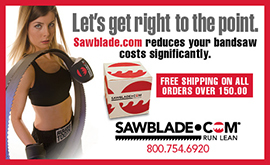 This entry was posted in All Posts and tagged #SawBlades, @SawBladeDotCom, alloys, Bandsaw, blades, carbide, Carbon, machining, metallurgy, metals, sawblade.com, steel, terminology. Bookmark the permalink.